I saw Shobana Jeyasingh’s double bill of Material Men and Strange Blooms with a friend who has contributed the following review. I had seen Strange Blooms before and although it is a different cast with some changes to the production I have not written about it again. In a time when borders are closed and fences built, Shobana Jeyasingh’s Material Men feels both poignant and topical. In the note to the performance, Jeyasingh reminds us that the abolition of slavery in 1833 caused a wave of migration from the Indian subcontinent as European colonies sought cheap labour. Inspired by such a long history of migrant displacement, Material Men is a reflection on the ways in which cultural memories transmigrate across places and generations and how individuals mediate, absorb, long for or reject them; how memories — whether integrated or suppressed — contribute to forge individual identities. How the past, which is both historical and mnemonic, roots and haunts us at the same time. 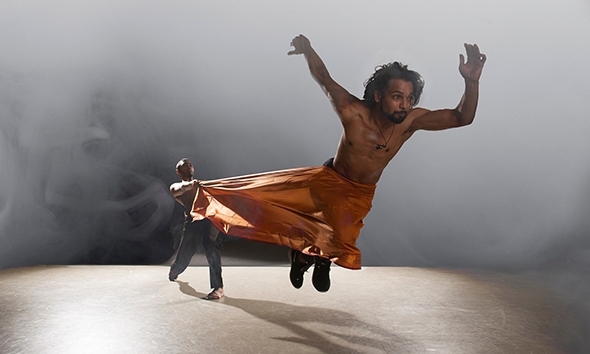 Choreographed for two male dancers on an original score by Australian composer Elena Kats-Chernin (played on stage by the Smith Quartet) with sound design by Leafcutter John, the piece opens with Sooraj Subramaniam and Shailesh Bahoran slowly entering the stage wrapped together in an orange silk sari. The account of their own family stories of migration can be heard in the background. The sari that ties the dancers together is like the fabric of histories and memories that weave shared pasts across times and places. It is the fabric that binds cultural, social and individual identities, the material with which each of us has to deal. It is ‘the continuous thread’ — as Marcel Proust writes — ‘through which selfhood is sewn into the fabric of a lifetime’s experience’. As they unwrap themselves from the sari and release it, Subramaniam and Bahoran display their different bodies and responses to the fabric of the past that links them. Tall and elegant, Subramaniam is trained in the classical bharatanatyam tradition. He is bare foot, and wears traditional make-up and jewelry. Shorter and slighter, wearing shoes and knee pads, Bahoran exudes tense physicality: he is a hip-hop dancer. These differences are indicative of the distinct styles of dance and modes of performing that Material Men bring together. Bharatanatyam is a highly formal dance that has been transmitted and refined across the centuries; hip-hop comes from street performance and a subversive mixing of influences from rock to Afro-American dance. Jeyasingh’s choreography seamlessly weaves these two types of dance into a complex tapestry of patterns that seems to follow an intersecting of symmetries and asymmetries as she elaborates the quintessentially distilled and minutely precise movements of bharatanatyam with the hybrid dynamics of hip-hop. Hence, hands and feet positions are mirrored and at the same time fractured, extended and taken in new directions as one dancer responds to the other in a physical dialogue that constantly draws upon a canopy of contrasting movements from which transpire no less conflicting feelings and emotions. Joy, tenderness, antagonism and suppressed rage intersect as limbs and gestural patterns crisscross. Subramaniam and Bahoran may be said to encounter in each other the stranger that according to Julia Kristeva we all carry within us and which forms us from histories of psychic, cultural and historical migration. The dancers variously accommodate and contend with each other, and with the ‘stranger’ that each of them reflects back to the other. From this encounter, visual and figurative forms emerge and disappear and in-between, in the interstices between sequences, moments of stillness are perceptible, as if they were ‘formless’ spaces, gaps saturated with possibilities and contradictions. It is in such dynamic flow of movement and stillness, of tension between form and formlessness that the transcultural features of the piece become palpable. Like the pleats with which Subramaniam carefully folds the sari, the layers are many and complex. Labels such as classical and pop, traditional and contemporary are reductive for what is a reconfiguration of the significance of dance movement as a medium that conveys the deeply embodied affect of cultural trajectories, backgrounds and individual histories. The work and the quest within it, however, are never nostalgic. The cultural allusions proper to bharatanatyam and hip-hop are conducive to the present, to the highly individualized interpretation that the dancers and choreographer confer on them by generating new synergies, overlapping rhythms and gestures. The piece concludes in a slow sequence in which Subramaniam and Bahoran move sideways off stage, one next to other, the arms parallel to the floor, half squatting. The movement feels endless as if melting into infinity, as if harmony and balance between pasts and presents, histories and memories were possible. As if continuity and reciprocity were not estranged by inner or outer boundaries. Jeyasingh’s Material Men is a thought-provoking work. And Subramaniam and Bahoran are both superb performers.